Published in the Dover Express, 16 May, 1980. Along Strond Street also ran the branch railway line connecting the main line ol the Southern Railway with the quayside railways, including the line to the Prince of Wales Pier — once serving Atlantic liners — and, via Marine Parade, the coal conveyor system from Tilmanstone Colliery which terminated in a waggon loading plant on the Eastern Arm. An important property in Strond Street, opposite Holy Trinity Church, was Northumberland House, from 1888 until 1934 the offices of the Continental Express Ltd (Messrs Friend and Co.) It was named by Mr William Forster, out of regard for his North Country ancestors, when he conducted the business of the Belgian Consulate and a shipping agency there. Previously, the National Provincial Bank was located there until its removal to New Bridge in the late 1860s. This bank, which, in 1932, moved again to the Market Square, took over the Dover bank of Messrs Minet and Fector in 1842. Minet and Fector did business in the same street for 150 years. They at one time occupied premises further south, on the quayside, at Pier House, Mr Minet’s private residence. The site of Minet’s house, which ran through from Custom House Quay to Strond Street, was later occupied by Lukey’s bonded stores. The old premises, which were taken down about the year 1871, to make room for those stores, were then so decayed that their condition was dangerous. Concerning that departed Strond Street mansion there are some famous memories. In April, 1814, on the restoration of King Louis XVIII to the throne of France, after 22 years of exile, he, on his way to Calais, halted for the night at Dover, and slept in Mr. Minet’s house, where, on the following morning, the Prince Regent breakfasted with him, the Mayor, Jurats, and Councilmen of Dover attending to present an address of congratulation. Again, on the 6th of June, the same year, when the Emperor of Russia, the King of Prussia, Marshal Blucher, and others landed at Dover, the Emperor of Russia was Mr. Minet’s guest, passing the night in the old Strond Street mansion. Trinity Church was a very prominent architectural feature in Strond Street. It was the first church built in Dover under the authority of the Church Building Commissioners, who made a grant to the building fund. The first stone was laid, in 1833, by the Archbishop of Canterbury. The consecration took place in September. 1835, the entire cost of the building site and the furnishing amounting to £7,973. The site of this church, when first reclaimed from the sea, was granted by the Harbour Commissioners to Mr George Byng (Jurat), who was member of Parliament for Dover in 1604; and the grant is supposed to have been a reward to him for obtaining a renewal of the Act for the tonnage dues. He built, on the site, a dwelling house for himself and two malt-houses. 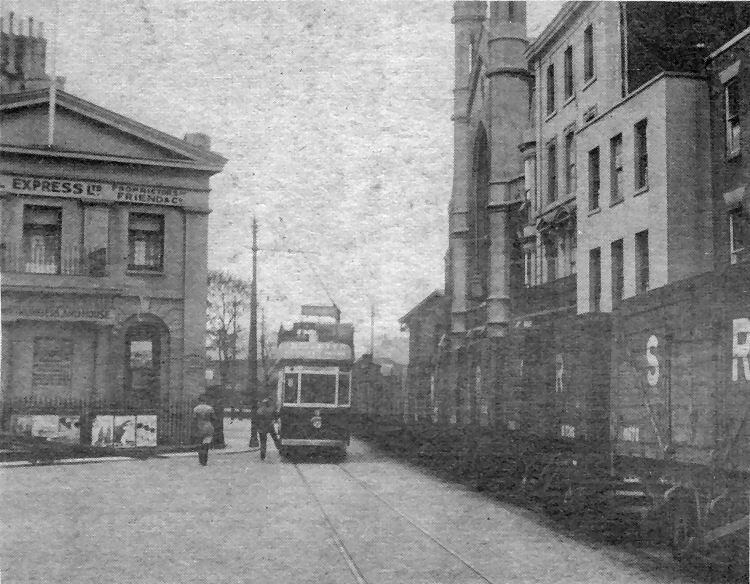 An open top tramcar and a Southern Railway coal train (bound to or from the Eastern Arm coal conveyor system) pictured side by side at Strond Street, on 25th May 1932, with Northumberland House, the offices of Continental Express, on the left, from which operated, according to a sign on the end wall, one of the earliest Bureau de Change. Directly opposite is Holy Trinity Church. 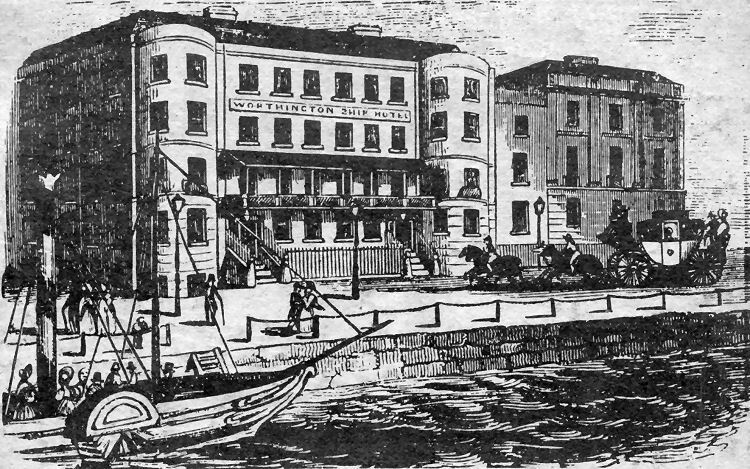 Dating from 1841 this engraving is of Worthington’s celebrated Hotel and Ship Inn, once known as the Royal Ship Hotel, facing the Granville Dock. Adjoining is Northumberland House.